After a few messages back and forth, I was on my way to the French Pyrenees, ready to volunteer on an organic farm and find out more. 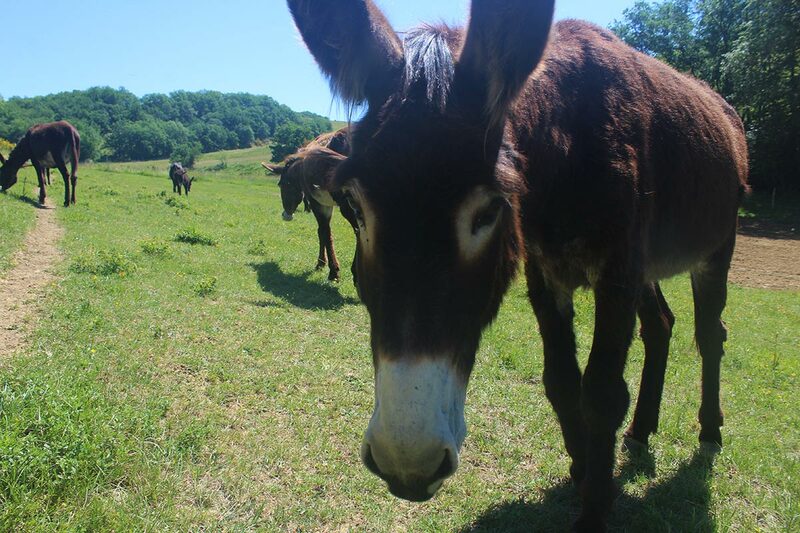 Cécile picked me up at the train station, and as we drove through the fairy-tale houses of stone and wood, never-ending poppy fields and medieval villages sprinkled with boulangeries, I had to ask her: Do most people know you can milk donkeys? She laughed and told me the fact is far from well known—when she explains her job, she sees quizzical faces all the time. 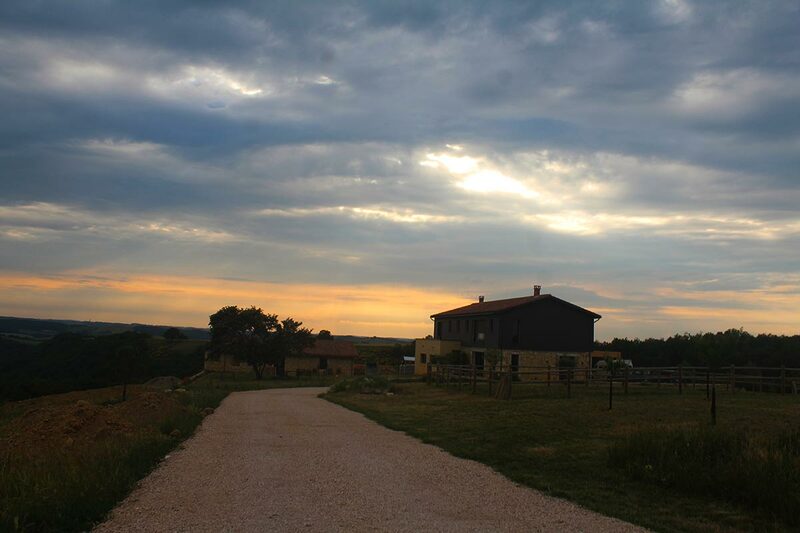 Sunset on La Ferme du Hitton farm. Before donkeys were in the picture, Cécile was living in Fiji and met Emmanuel, a fellow traveller, during a divemaster course. They spent the following years travelling and working abroad together before returning to their native France. 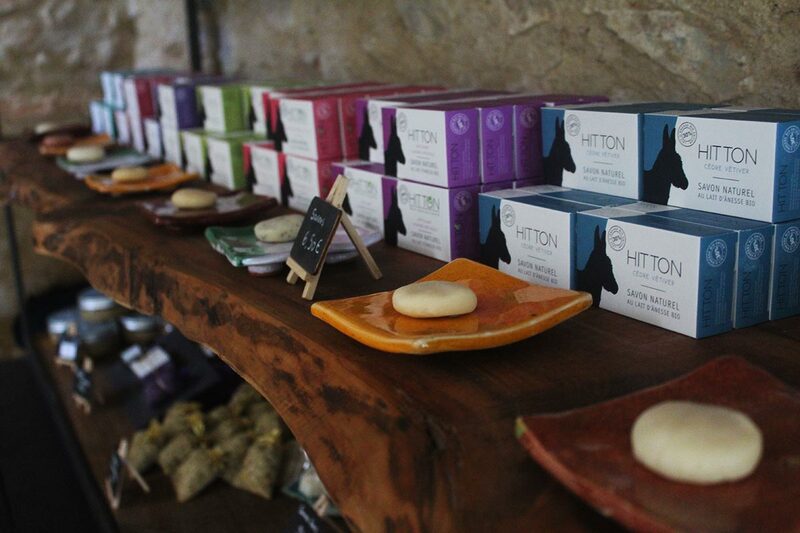 “Once home,” Emmanuel later told me, “we wanted to start an environmentally conscious project and raise our children in harmony with nature and animals.” With Cécile’s background in cosmetics and Emmanuel’s strong business sense, a new venture was born: La Ferme du Hitton. Donkey’s milk has a chemical composition that makes it ideal for skincare. That’s where the donkeys come in. It might sound strange, but the cosmetic and medicinal effects of donkey milk have been documented for centuries. Its composition, rich in proteins and ceramides, make it an ideal ingredient for natural cosmetics. Their donkeys are a species unique to the southwest region of France—specifically the Pyrenees mountain range, which creates a natural border between France and Spain. A local and protected breed, the Pyrenean donkey unites the shorter Gascon and the taller Catalan types. Historically, such donkeys were used as pack animals to help bring down hay and ice from sometimes 3,400-metre-tall peaks. 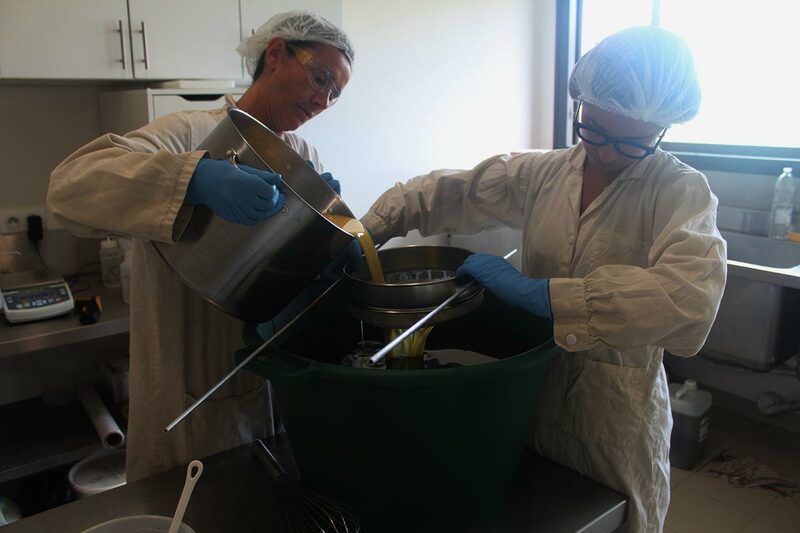 Making soap at La Ferme du Hitton. Unfortunately, I arrived a few weeks too early for the commercial milking, as the donkeys had just started giving birth and feeding their young after a 13-month gestation period. But I got thrown right into the saddle, so to speak. I got to take part in another important donkey ritual. The mothers had been separated to give birth and care for their offspring for several weeks. The time had come to introduce one of the new babies, along with the mother, to the herd of donkeys. And, it turned out, I would be helping make that happen. 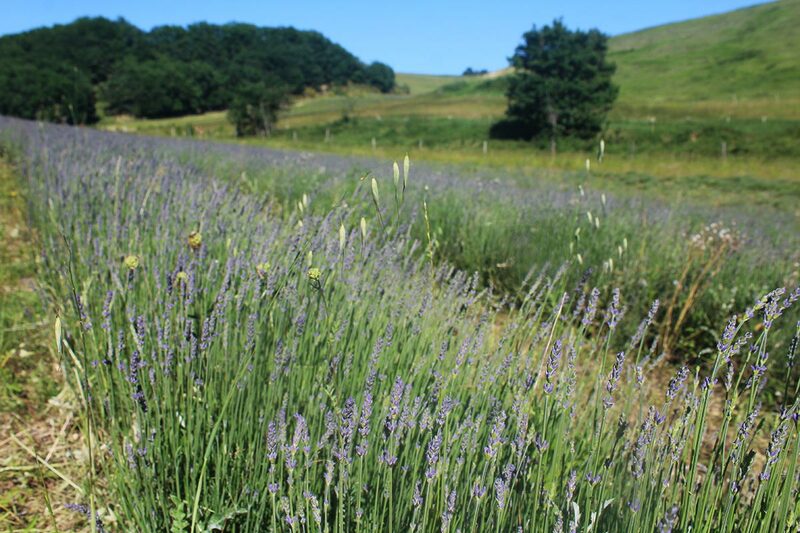 The farm has around 50,000 lavender plants. I kept the donkey mother calm while we added a harness to transport her. I then guided her through the fields, while the fluffy baby followed closely. “Make sure to be firm so you don’t lose her,” Cécile instructed me through the experience. One wrong move and I’d have a donkey runner on my hands. But after numerous and careful steps, we made it to one of the donkey areas. All the donkeys stopped and stared at us curiously, recognizing the mother and seeing her baby for the first time. We waited to see if the baby would be accepted into the group. I never thought I’d spend so many intense minutes analyzing donkey socialization patterns. Cécile gave me the play-by-play. “When they have their ears forward like that, they’re attentive,” she told me. Donkey ears do a lot of talking; one forward and one back means they’re curious, while both ears back and down means it’s best not to approach. One donkey stepped forward while the baby stood bravely and the mother kept close watch nearby. The others followed and were soon inspecting the newest member of their clan. It wasn’t long before they started chasing him around playfully. I’m no donkey expert, but I think that was a good sign. Say hello to the newest member of the clan. Today, Cécile is a donkey pro, but basing a business on the animals was a leap of faith. “One of the few times I came so close to a donkey in my life was on the day we bought the first one,” she says. 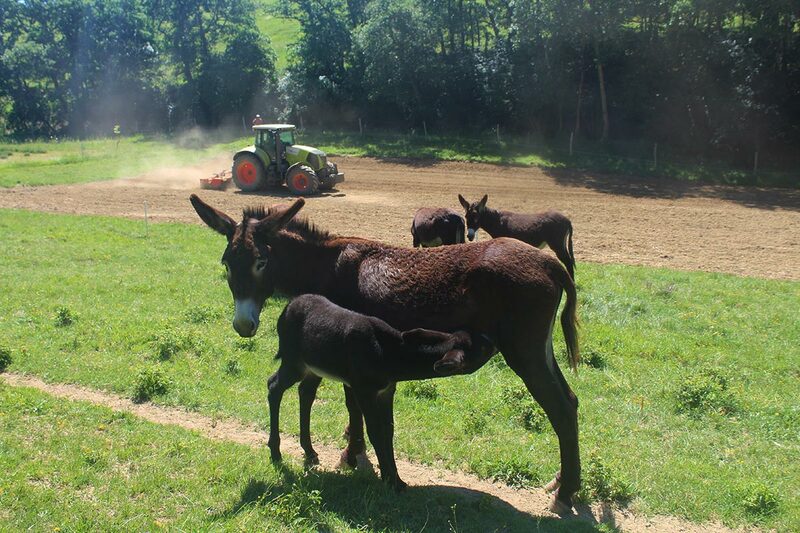 Now, they have close to 30 donkeys at La Ferme du Hitton, and what started off as a far-fetched idea has evolved into a fully fledged career. The mother we introduced to the group should be ready to start cosmetic milk production in just a couple of weeks. And although I didn’t get to try my hand at donkey milking this time, I did make sure to celebrate my first-ever successful baby-donkey introduction with a cold glass of lavender beer.